Did you know that this is the New Year for the Church? Seriously. In the official church calendar this is now the new year for the Church. The journey to Easter begins today as we go through Christmastide, then Epiphany and then Lent. I know. That's some pretty nerdy church stuff. Sue me. I'm kind of a church nerd. What does this teach us? I mean even my tortuous Christmas mornings had a lesson, so there has to be one here, right? What is Christmas really all about if we think of it in light of a new year for the Church and the beginning of a journey toward the Cross and the Empty Tomb? I think it comes down to this: Even in the brokenness... even in the randomness of life... the craziness of our weeks and months... even in what seems lifeless, dark and gone... new life springs forth. Or to put it even more plainly.... Even when things don't go as planned, God arrives. The way God chose to enter history should teach us a lot about ourselves as we stumble after Jesus. We need to be reconnected with the story of Christ's birth in new ways so that we can internalize it, identify with it, make it our own story, the story of our redemption, the story of our rescue and resurrection. Let's read a passage of Scripture from the prophet Isaiah which will shed some light on this for us. It's a passage that was written during a time of uncertainty and conflict--a prophecy of hope and peace. 9:2 The people who walked in darkness have seen a great light; those who lived in a land of deep darkness on them light has shined. 9:3 You have multiplied the nation, you have increased its joy; they rejoice before you as with joy at the harvest, as people exult when dividing plunder. 9:4 For the yoke of their burden, and the bar across their shoulders, the rod of their oppressor, you have broken as on the day of Midian. 9:5 For all the boots of the tramping warriors and all the garments rolled in blood shall be burned as fuel for the fire. 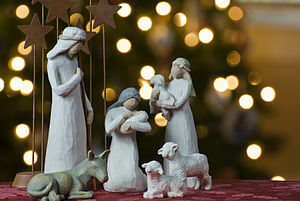 9:6 For a child has been born for us, a son given to us; authority rests upon his shoulders; and he is named Wonderful Counselor, Mighty God, Everlasting Father, Prince of Peace. 9:7 His authority shall grow continually, and there shall be endless peace for the throne of David and his kingdom. He will establish and uphold it with justice and with righteousness from this time onward and forevermore. The zeal of the LORD of hosts will do this. The prophet is speaking in a time of turmoil, brokenness and exile. These were dark times for the people of ancient Israel. But the hope that the prophet is expressing is a universal hope for peace and restoration for not just the children of Israel, but all people who have been lost in exile, feeling abandoned and alone. Today, we read this text as a fulfillment of that prophecy. The Christ, the Messiah, the Prince of Peace has come, the waiting is over, the day of the Lord has arrived! And this is the moment when many of us who are gathered here today would say, "So, why are things still so messed up? Why isn't the world set to right? Why is there so much strife, violence, greed, division, hatred, bigotry in this world? If the Lord has come, then why isn't it better?" What we know as the Holy Land in the first century was full of uncertainty. Terrorist groups were active, striking Imperial Roman targets, but also harming and killing innocent people as well. There was always the threat of war and strife in the air. The Roman Empire was hailed for bringing peace and order to their conquered lands, but it was a sham and almost always brought about by violence or the threat of violence. The people of Israel were taxed to the point of poverty. There was religious division, political division, division by class and gender as well. I am so glad that we've worked out all of that stuff, and have moved on from it--aren't you? Nothing about that moment two thousand years ago seemed perfect or planned. The Christ, the Messiah was born to homeless refugees who were forced by the government to be registered for taxation. They couldn't find a place to stay, and so had to deliver their firstborn child in a stable, and lay him in a feeding trough. If God can arrive in those circumstances, why is it so hard to believe that God's truth and joy, and peace will show up in our own circumstances? Why is it so hard to believe that when things aren't going exactly as planned, when our dreams have been ruined, our hopes dashed our joy stolen that God will arrive? The story of that first Christmas teaches us, reminds us that God shows up to anyone who will listen, to anyone who has a broken and longing heart, to anyone who feels as though all hope is lost. As you step into this new year, I want you to hold on to this truth. There will be days ahead when things will not go well. You will face hardship, tough decisions, and difficult seasons. But I want you to know that in the middle of all of that uncertainty... God arrives. Hold on to this with all of your might. When you feel broken and lost, when you are wondering what comes next. When your faith is waning and your belief feels like it's smaller than a mustard seed... God arrives. God arrives, beloved. Even when things don't go as planned. God arrives. Go out into this new year, this new world with the joy of your salvation threatening to burst through your chest. Because God arrives. God arrives.